Displacement maps can be thought of as extended bump maps. Like bump maps, they are grayscale images, with the intensity of a pixel indicating height above the polygon surface. 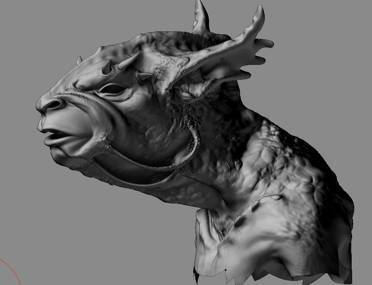 Other things being equal, a single grayscale image used as either a bump or a displacement map while building a model will probably produce very similar images when viewed using a “real time” renderer. The result is different when a final render is done. 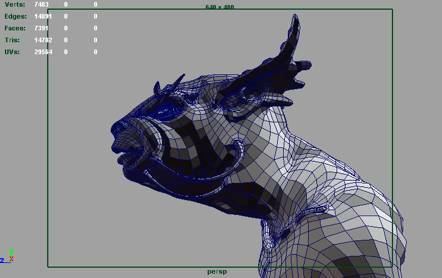 At this stage, the displacement map is used to actually change the geometry of the model. Conceptually, new polygons or pixels are produced where the displacement map indicates height deviations from the polygon surface, and then this new geometry is pushed up to reflect the height of the bump map. This new, higher-resolution model is then rendered. 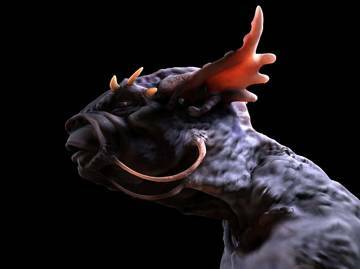 As a result, displacement mapping can produce renders which show both correct silhouettes and shadowing of displaced geometry, something which cannot be done by bump maps. Displacement mapping is well suited for surfaces containing complex detail that would be difficult and expensive to model with polygons, but where the displacement is large enough that bump maps would obviously appear fake. There is currently little hardware support for displacement maps, so they are typically used with software renderers. (This may change in the future.) Bump maps and normal maps are both well supported by modern video cards. Any of these tools can provide very realistic effects in cinematic and other non-real-time renders, allowing both decreased overall render times, and greater ease of model construction.